and Julianne Moore as rebel President Coin. MOCKINGJAY is a dirge of a film. Two hours of hackneyed dialogue, J-Law stumbling around debris with PTSD interspersed with the occasional attempt at a rousing speech for rebellion. The movie has no pace, no flow, no excitement, largely because it's basically pre-amble to the final showdown between the oppressed masses and the ruthless President of this dystopian future dictatorship. I'm not sure how the young fans of Suzanne Collins' wildly successful books will react to the style and content of this film but I found the shift in tone from the gladiatorial action of the first two films to the attempt at earnest commentary on war jarring. Which isn't to say it isn't an honourable attempt at engaging with contemporary politics, but my god it isn't entertaining either. 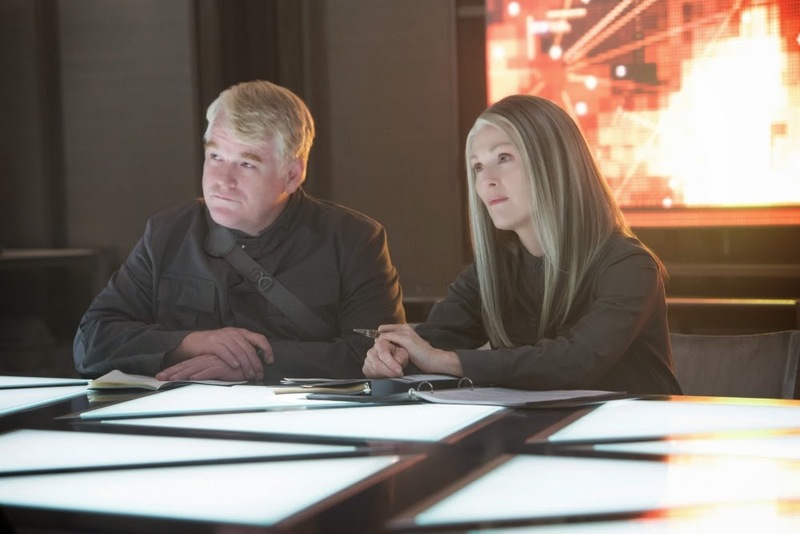 As the movie opens, Katniss Everdeen (Jennifer Lawrence) has been rescued from the Hunger Games and wakes up traumatised in District 13 - an austere military bunker run by the sinister President Coin (a typically steely Julianne Moore). Coin decides to pimp Katniss out in much the same way as her nemesis President Snow (a 2-D villain played with mustache-twirling glee by Donald Sutherland) did. Instead of schmaltzy TV interviews for the state, Katniss now does supposedly impromptu Churchillian speeches urging the rebels to rise up - all of which have been expertly stage managed by Coin and her on-the-ground director Cressida (Natalie Dormer). The movie cruises toward the inevitable showdown contrasting the "propos" with the terrorist/freedom fighter acts in various districts. And all the time, in the background, there's Katniss' demand that Peeta be rescued, culminating in an extraction that is clearly inspired by the Navy SEALS raid on Abbotabad. All of this is fine, except that it gets undercut by the hokey dialogue and plot turns. Of COURSE, when Katniss rescues her sister's cat we just now there's going to be some perilous plot moment when rescuing the cat places Katniss in jeopardy. And the scenes near the end when President Coin commands her troops against a state bombing campaign reeks on the final scenes in STAR WARS: A NEW HOPE. Overall, I'm not sure whether they really needed to cut the final book into two films. This first part could easily have been much shorter - just one propo - just one montage of the people rising up - because what we want to get to is the final fifteen minutes of Part 1 and then all of Part 2. I applaud the good intentions to get gritty and real but once again, I'm just not sure how this constitutes any kind of credible storytelling in a world of such outlandish fantasy costumes and hokey dialogue and cartoon villains. MOCKINGJAY has a running time of 123 minutes, is rated PG and is on global release.